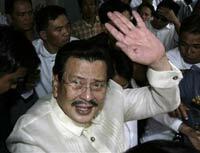 Former Philippine President Joseph Estrada said Tuesday he would consider a presidential pardon that could set him free. It was the first time Estrada had publicly stated he was open to such a possible offer from his political nemesis, President Gloria Macapagal Arroyo. Arroyo, however, has not indicated if she would be prepared to offer such a deal. After his historic conviction last week, his aides said he would likely reject a presidential pardon. However, in a telephone interview with The Associated Press on Tuesday, Estrada said he would consider accepting a pardon if it did not amount to an admission of guilt and did not come with any preconditions. "I first have to read the fine print of any such offer," Estrada said. Estrada's acceptance of a pardon, which could only be granted by Arroyo under Philippine laws, could help ease political tensions that have gripped the country since 2001, when he was ousted in a nonviolent "people power" revolt she helped lead. Opposition Sen. Mar Roxas filed a resolution Monday calling on Arroyo to offer a pardon to Estrada to heal political divisions. Arroyo has not yet commented on the resolution. "The grant of pardon to Erap on humanitarian grounds should not in any way be construed as condoning corruption or as diminishing the legal weight of the (conviction) ruling," Roxas said, using Estrada's popular nickname. "While our people are fragmented, they share one thing: they remain poor, and it is because our politics has failed to pay attention to them," Roxas said. Estrada was convicted by the anti-graft Sandiganbayan court on Wednesday after a landmark six-year trial on charges that he took bribes and kickbacks while in office. His conviction on plunder carried the death penalty but capital punishment has been abolished. He was acquitted of perjury related to allegations he falsely declared his assets. He also was ordered to forfeit a mansion and more than US$15.5 million (EUR 11 million). Estrada, a former action film star who once pulled off the biggest election victory in Philippine history, remains popular among impoverished Filipinos, who adored his B-movies where he often portrayed roles as a fast-punching defender of the poor.